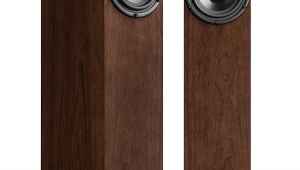 Did you hear the one about the audiophile looking for speakers? Well, it seems he had a dilemma. On the one hand, he (it's a he, isn't it?) was obsessed with audio quality. He searched out (and was very impressed with) the Wilson WATT/Puppy/WHOW setup (about $23,000). 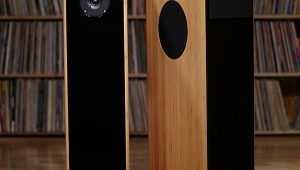 He really liked the Avalon Ascents (they had been raved about in The Absolute Sound—they were $16,500 or so depending upon the finish, the state of the dollar, and the quality of the most recent review, it seemed). On the other hand, he had a family to support. 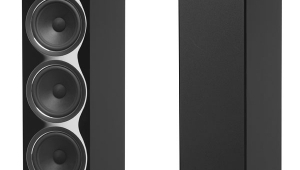 Wasn't this an ungodly amount of money to spend for speakers? If only they cost $5000 or so...How could he ever get the level of performance he coveted while spending an amount of money he could justify? But he had listened to all of the $5000 speakers, hadn't he? 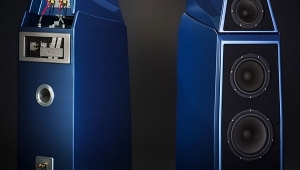 Let's see now, there were the Merlin Signature Fours, the Snell Type A/III Improved, the ProAc Studio Towers, B&W 801 Matrix Series II, Mirage M-1s, Quad US Monitors, MartinLogan CLS IIs with subwoofers, and many other very worthy contenders. But none of them seemed just right, as Goldilocks might have said. Back to the big bucks—the Infinity IRS Betas and Thiel CS5s. "Too much money!" groaned his conscience. Where, oh where, was he to turn? Speakers either cost too much or had shortcomings, however minor, that galled him at this price level. 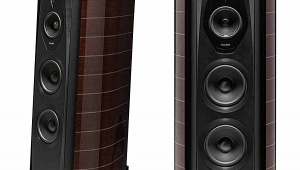 Shouldn't more expensive products sound more alike? Shouldn't they be converging on a more realistic—and similar—sound? Why, oh why, did they all sound so different? And why did they all have to cost so much? J. Gordon Holt has argued loud and long over the necessity of listening to recordings of live performances of unamplified music. In essence, this leaves us with classical performances, typically of orchestras to fully test an audio system's sonic capabilities. Harry Pearson has gone so far as to name his magazine based upon this fundamental principle. And with good reason. Yes, all halls are different and all recordings are different, but there's a fundamental truth in the sound of a violin or an oboe. After all, what is the natural sound of a synthesizer? A large part of my psyche agrees with this argument. How can you comment on the soundstaging of a multi-track popular recording when the performers never performed in the same space and probably didn't even perform at the same time? Yeah, it had to be live, unamplified orchestral music. If something could get that right, it could get anything right. (But, on the other hand,) Bull! Tony Cordesman was right. Just because something can recreate a string quartet realistically doesn't guarantee squat when it comes to Metallica! Rock'n'roll is the predominant musical form, outselling classical by a margin of 30 to 1. Shouldn't a good audio system be able to play rock (to play loud and to play deep bass)? Of course it should. Quite frankly, many "audiophile" systems can't do it. Period. They wimp out. They can't recreate the intended visceral impact the musicians heard on those old JBLs in the studio. 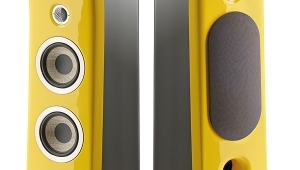 If a speaker is going to be able to play whatever I want to listen to, it better be able to play rock. 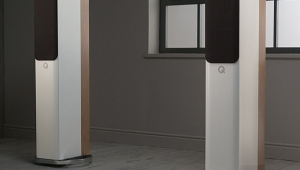 Speakers with little bass and constricted dynamics simply won't do. I don't (oops—that is, he doesn't—back to the story line) want to live with nice, musical, euphonic speakers. He wants speakers that can handle whatever he feels like throwing at them. Some nights it might be the Emerson String Quartet, but on other evenings it might be Axel Rose. So, mimicking Goldilocks, he continued the search. Naw, this one has no bass. No, this one has a flat soundstage. Nah, this one lacks dynamics. Nope, this is too bright. And so it went. With very few exceptions (eg, the Mini-Towers and Extended Bass Tablette or EBT), I have very much enjoyed all of the ProAc products. Of particular note is the Response Two (especially on the R2 Target stands imported by May Audio Marketing). The only valid criticism of the Response Two is its lack of truly extended deep-bass response. It's a little box, after all, and even Tyler has been unable to rewrite the laws of physics. 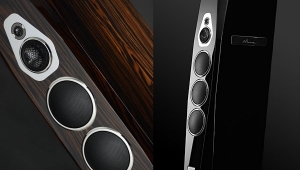 All of which brings us to the latest ProAc speaker—the Response Three. If nothing else, Tyler is predictable. By adding a second midrange/woofer driver he created the EBT (from the Tablette), the Super Tower (from the Studio One), the Mini-Tower (from the Super Tablette), and now the Response Three (from the Response Two). Such a strategy has been a hit-and-miss proposition for ProAc. The underlying concept seems simple enough: two smallish drivers should be able to reach deeper into the bass yet still be fast enough to handle the midrange. 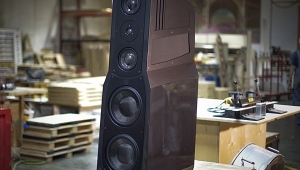 In this case, the midrange/woofer drivers are 6½" polypropylene-coned units from Scanspeak. Tyler consistently relies on a few other predictable approaches. For one, better bass can be achieved out of a bigger box. The Response Threes adhere to this rule as well, being largish, floorstanding cabinets with front-firing ports. And, as most of you should know by now, ProAc firmly believes in mass. They apply mass-loading in two ways for most of their speakers, the Response Three being no exception. First, spikes come with the speakers. Second, sand (or lead shot, or whatever) can be added into small compartments located at the bottom rear of the cabinets. The Threes use the loading material to actually "tune" the bass. 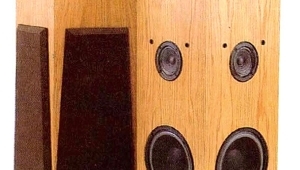 Too much material and the sound becomes dull and lifeless; too little and, besides losing the benefits of mass loading in the first place, the sound lacks articulation and becomes slightly boomy—the Three's sound character prior to loading. 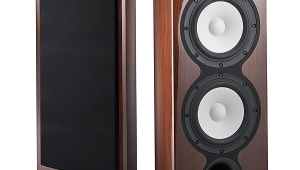 Doubling up on the midrange/woofer drivers has many other advantages. For starters, a two-way crossover can be used. No matter what else we've learned along the way, simpler is often better. It should be easier to get a better sound out of a two-way crossover than a three- (or more) way. 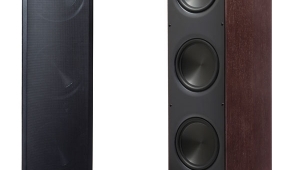 A three-driver, two-way speaker also lends itself to what I've called the co-centric center layout (more appropriately described as the D'Appolito configuration). 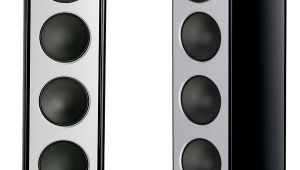 The intent is to create a vertical array of drivers with overlapping sonic centers. Such arrays (as found on Hales, Merlins, Duntechs, and others) are invariably stacked vertically in a straight line. Tyler, as is his wont, breaks the mold here as well. Though the drivers are in a line, this is not vertical, being tilted inward so the topmost driver is toward the inside of the cabinet while the bottommost driver is toward the outside of the cabinet. This also means the Response Threes come in mirror-imaged pairs.